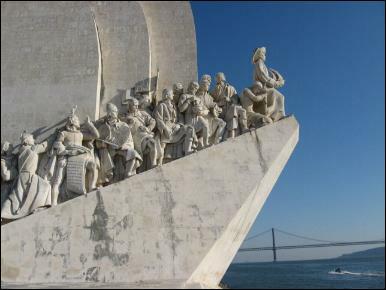 The Monument to the Discoveries in Lisbon. Portugal might be a teeny country right on the western edge of mainland Europe (I said mainland oh you Irish who might want to lynch me right now), and right on the edge of bankruptcy (who said that? ), but the country had an enormous influence on our world as it is today. 1. Portugal is Britain's oldest ally? Ratified by the Treaty of Windsor in 1386. The Portuguese, in general, are pretty proud of this; the Brits, in general, are pretty ignorant of the fact. 2. Portugal introduced tea into Britain. Catherine of Braganza brought it with her when she married Charles II of England. She didn't bring it with milk though. 3. It is said that Christopher Columbus first tried the King of Portugal about his theory that he could reach the east Indies by sailing west but was refused because Portugal already had its wealthy Indian routes established. It is also said (allegedly, thought...you check it out) that Columbus married a Portuguese noblewoman (daughter of Bartolomeu Perestrelo, who had a hand in discovering Madeira Island) and lived for a time on Madeira's teeny sister island, Porto Santo. 4. The Treaty of Tordesillas in 1494 divided up the newly discovered lands between Spain and Portugal and excluded any other European nation. That's the reason the language of Brazil is Portuguese and the two countries have a very close rapport even today. 5. Over 240 million people across the globe speak Portuguese. (240 million and one - because I do too). 6. Prince Henry the Navigator never went to sea - he directed the great Age of Discoveries from land. 7. The great Age of Discoveries probably started in the 13th century but it was really the 15th and 16th centuries that saw the greatest movement when such famous names as Bartolomeu Dias, Vasco da Gama, Pedro Alvares Cabral, Fernão de Magalhaes and so many others formed important trade routes and colonies, creating incredible wealth from the East (see: Wikipedia if you're interested). Interesting post, Sue. Although I've only visited once very briefly, Portugal is a lovely place. Have to admit, as a Brit, I was indeed completely ignorant of our specific links with the country. Good luck with the rest of your challenge and I hope you are enjoying it as much as I am. I'd love to visit Portugal. I always thought tea arrived as part of the slave trading. They say it's tea that enabled our country to survive the industrial revolution... apparently. Thanks Kelly - ha! I knew it. Let me know when you do, Brinda. I know, Rosalind - there are no doubt many different versions about tea. This is one of them. Oh by the way! Talking of slave trading - the Portuguese pretty much started it (tsk) but I BELIEVE they were the first to abolish it too. I remember reading about Henry the Navigator and really starting all that exploration. Often times BIG things come out of small places. I think lots of people forget the history of Portugal as a world power because they're a small country. I loved this mini lesson about Portugal. When I think of Portugal, I think of sunshine. Henry was a distance navigator. @Bish - brings back the old history lessons, huh? LOL Mark - I think she's on her knees behind him actually @Susan everyone forgets Portugal, even the weather man stands in front of it, @Annalisa - see??? Told you no-one in the UK knows that fact. Thanks Carol (it's raining today LOL). Yep, Alex, so he was. Hello, Susan! This post is fascinating. I didn't know any of this! Does Britain remember the Portuguese introduced them to tea? Tea is so ultra British that I thought they introduced it to everyone, LoL. I for one know that tea wasn't originally British - and I'm a rare British person in that I don't drink it. Perhaps that's why I know! I have a friend who is from Portugal, and I loved hearing her stories about the country. I really enjoy visiting Portugal. The Portugese were great travellers and stamped their culture on may countries around the world. Portugal is on my list of places to visit. I have a friend that was there just a few weeks ago. I was so jealous. Dropping by from A to Z. First year participating. Portugal introduced tea into Britain? Oh wow! I didn't know that! Great info. We used to go on holiday to Portugal's Algarve, beautiful area! Certainly adventurous for such a small country! I had to do a project on Portugal in school but couldn't find out much. If only this blog had existed! Great post, Sue. Really enjoyed it - and I learned a lot!